Specializes in reconstructive surgery of the maxillofacial region, surgical correction of malocclusion (orthognathic surgery), facial plastic surgery (rhinoplasty, blepharoplasty, genioplasty, etc.). PhD, assistant professor of surgery and maxillofacial surgery of the National Medical University. 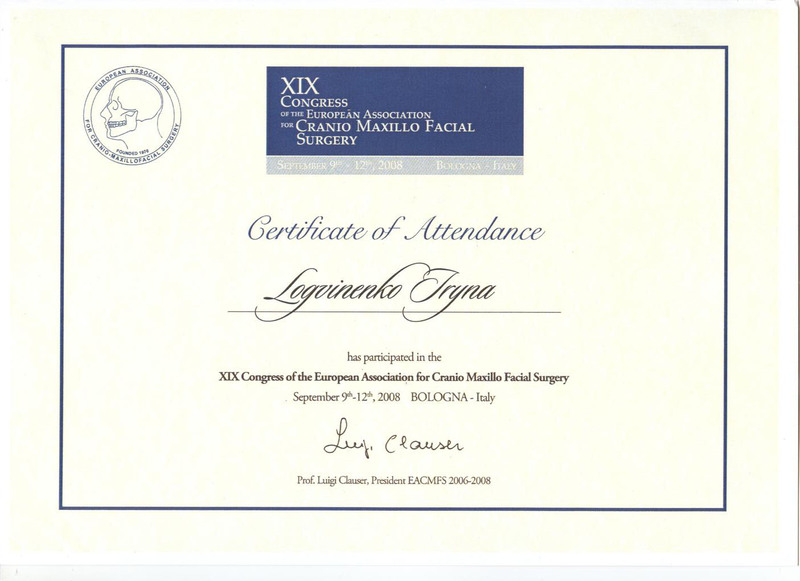 2015 - Facial Plasty Surgery Course (Salo, Italy). 2014 - Simonas Gribauskas Ortognatic Live Surgery Course (Vilnius, Lithuania). 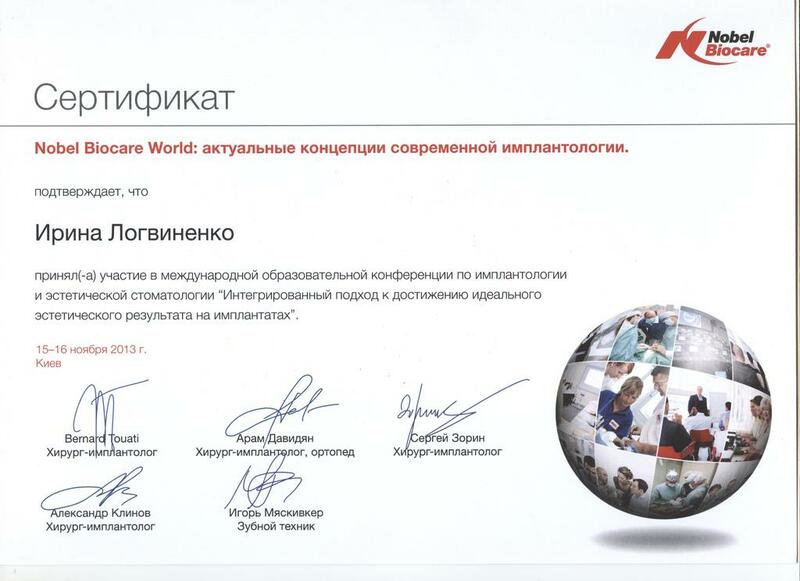 2013 - Nobel Biocare World: current concepts of modern implantology (Kiev). 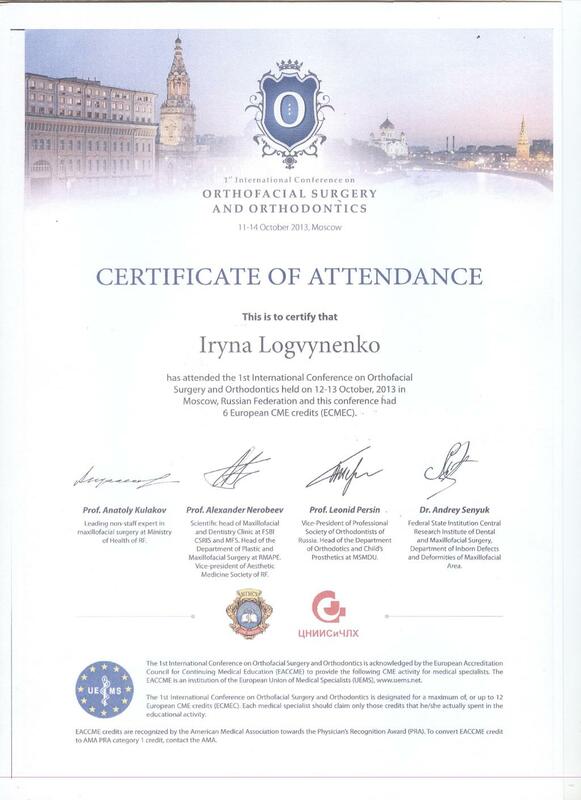 2013 - The 1st International Conference on ortofatsialnoy surgery and orthodontics (Moscow). 2011 - Aesthetic aspects of dental implant (Biohorizons, Kiev). 2010 - Planning for surgery and orthodontic preparation of patients with skeletal malocclusion (Vilnius, Lithuania). 2008 - Participants of the III East European Congress on dental implant osseointegration (Kiev, Ukraine). 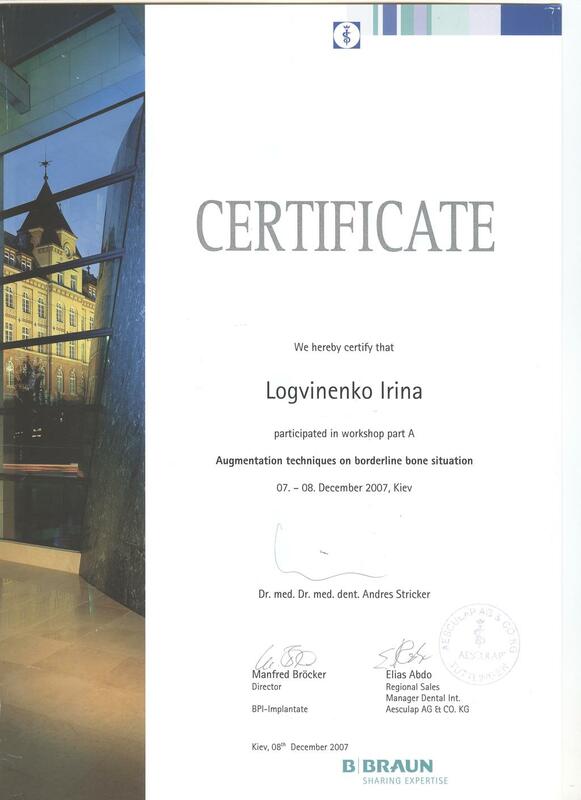 2008 - Practical course for bone grafting alveolar processes (Aesculap). Specializes in the treatment of dental and periodontal diseases. She holds of techniques of root canal filling, art restoration of teeth. Graduated the National Medical University A. A Bogomolets. Passed an internship on the basis of National Medical University A. A Bogomolets. 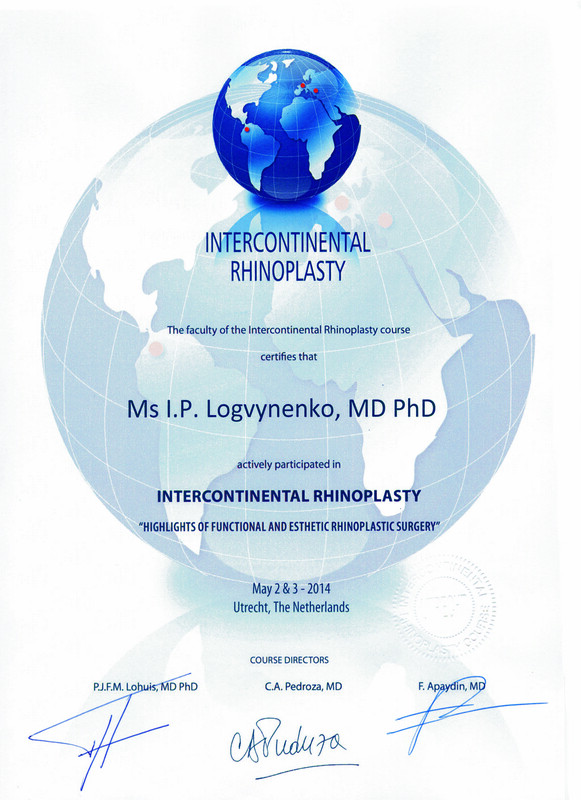 June 6, 2016 - Kiev, master class "Modern Endodontic Treatment"
Specializes in all types of therapy treatment: artistic restoration, endodontic treatment, hygienic procedures of any degree of complexity, whitening. Passed an internship at the Ukrainian Military Medical Academy in Kiev. April 25-27, 2012 - the 74th International Medical Congress of Young Scientists "Actual problems of clinical, theoretical, preventive medicine, dentistry and pharmacy"; The diploma of 3 degrees. April 24-26, 2013 - the 75th International Medical Congress of Young Scientists "Actual problems of clinical, theoretical, preventive medicine, dentistry and pharmacy"; The diploma of 1 degree. October 23-25, 2013 - the 67th International Medical Congress of Young Scientists "Actual problems of modern medicine". 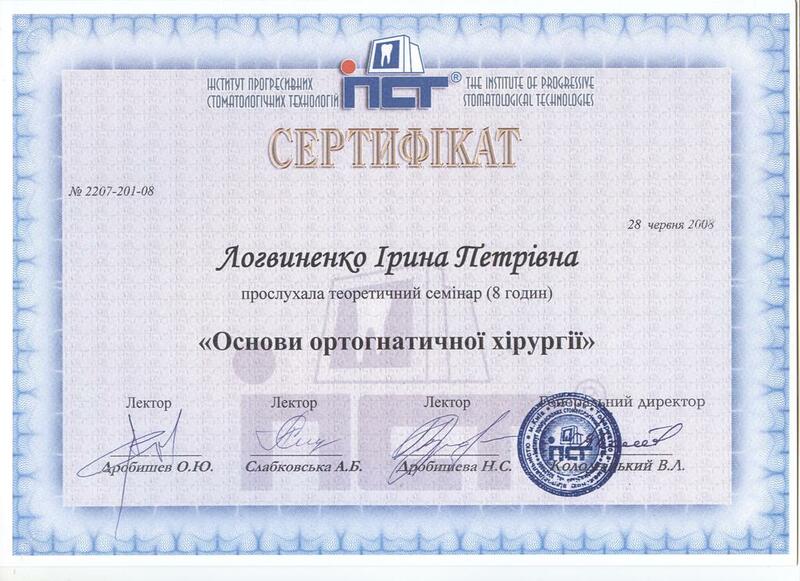 April 23-25, 2014 - the 76th International Medical Congress of Young Scientists "Actual problems of clinical, theoretical, preventive medicine, dentistry and pharmacy"; The diploma of 3 degrees. 09/21/2014 - seminar "Complex approach in dentistry from endodontics to restoration 2". 06/06/2015 - practical seminar "Innovative technologies in processing and obturation of root canals." 10/09/2015 - course "Modern digital laboratory". Specializes in endodontic treatment, micro, owns the techniques of direct restoration and tooth whitening. It is installing veneers and all-ceramic crowns. Work experience 8 years. 2007 graduated from the National Medical University. November 28-29, 2015 - Kyiv, Ukrainian endodontic community "5 Congress UES". November 21-22 , 2015 - Kyiv, "Author's two-day course Alexei Krasnozhon: Diagnosis and planning or functional and aesthetic analysis." November 3, 2015 - Kiev, Direct restoration of anterior and posterior teeth. 17-18 October 2014 - Kiev, Prosthetics on implants: a confident view of the challenges. 9 -30 November 2014 - Kiev International Congress of Nobel Biocare World 2G: Modern concepts as a factor in successful implant treatment. 23 February 2013 - Kiev, Dr. Ivankina N. Course for Clinical Occupational Health. December 8, 2012 - Kiev, Dr. Mitsuhiro Tsukiboshi, teoreticheky course: "The trauma of the teeth. Autotransplantation teeth"
October 20, 2012 - Kyiv, Andrew Long, seminar: "Ergonomics at the dental reception"
12-13 October 2012 - 2nd Congress of Ukrainian endodontic community. 7-8 September 2012 - Kiev - Dr. Zurabovich Givi Ordzhonikidze, course: "Achieving optimal and esthetic results in prosthetic implant." The course for surgeons and orthopedists. 2 June 2012 - 1st Congress of Ukrainian endodontic community. May 19-20, 2012 - Lviv, Dr. Domenico Massironi seminar: "Modern approach to orthopedic RESTORATION"
13 March 2012 - Kiev (4.02.2012 Odessa) - KMN KULIGIN OB seminar: "Special Issues in Endodontics"
24 March 2012 - Kiev - Seminar: "Perfection embodied in ceramics"
February 20, 2012 - Kiev - KMN KULIGIN OB, theoretical and practical course: "Modern endodontic treatment"
11 February 2012 - Others. Maxim Lesnuhin master class: "Total prosthetics dentition. 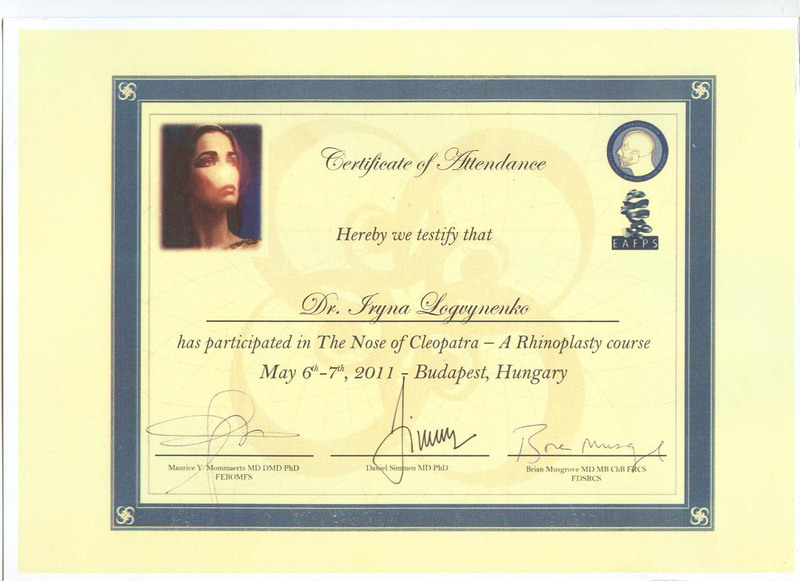 Clinical and laboratory protocols"
June 5, 2011 - Kiev practical course "Microimplants in orthodontic treatment." 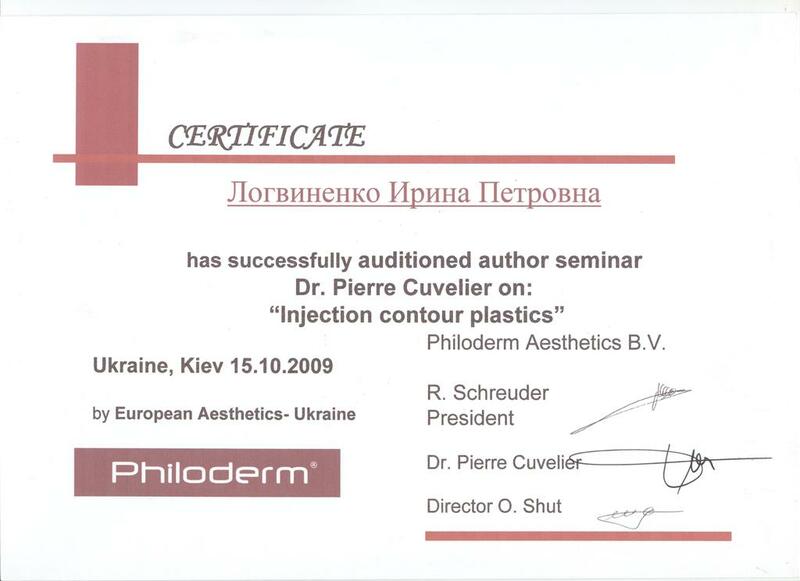 December 3, 2011 - Kiev, seminar "Endodontics by the rules of art instrumentation 3." 2009 - Metal-free prosthesis (Media Dent). 2009 - Orthodontics START SCHOOL (Media Dent). 2009 - prevention of oral diseases, minimally invasive technique and restoration of severely damaged teeth with maximum preservation of natural fabrics (Kristar). 2009 - A differentiated choice of material and method of teeth restoration (3M ESPE - prof. Trevor Burke (UK). 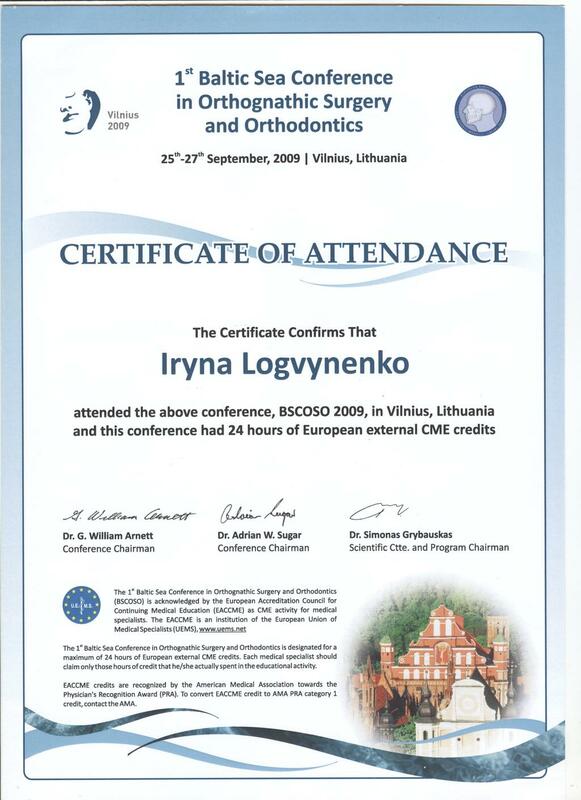 2008 - Took part in the 2nd International Conference "Actual problems of clinical dentistry and periodontology" (Kiev, Ukraine). 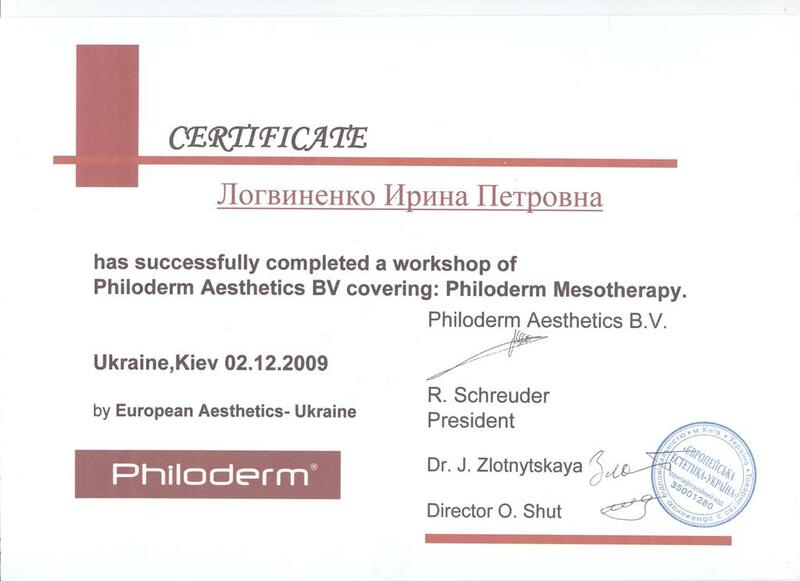 2008 - Practical dental implantology (Kiev, Ukraine). 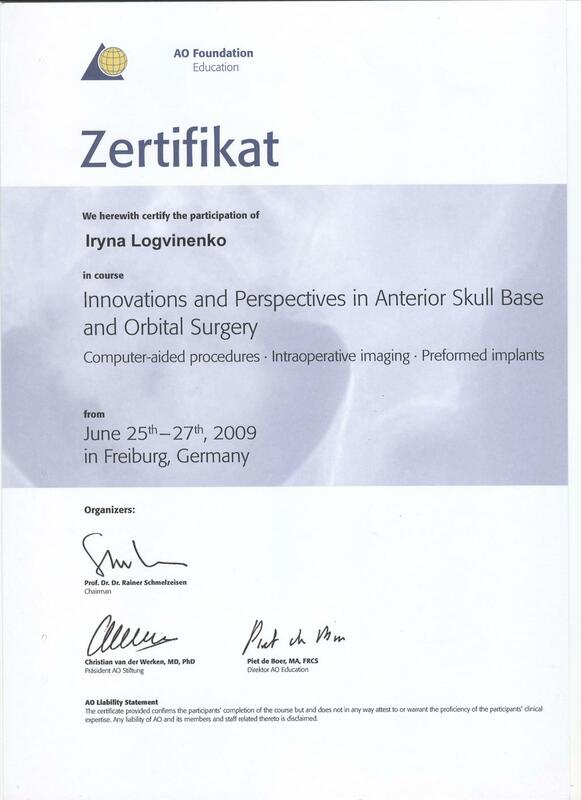 2008 - Modern methods of non-metal prosthesis (Kiev, Ukraine). 2007 - Minimally invasive, esthetic rehabilitation of teeth (Kiev, Ukraine). 2003 - HeraCeram & Heraeus Casting System (Kiev, Ukraine). Specializes in the correction of malocclusion and malposition of the teeth using plates, braces, splints. 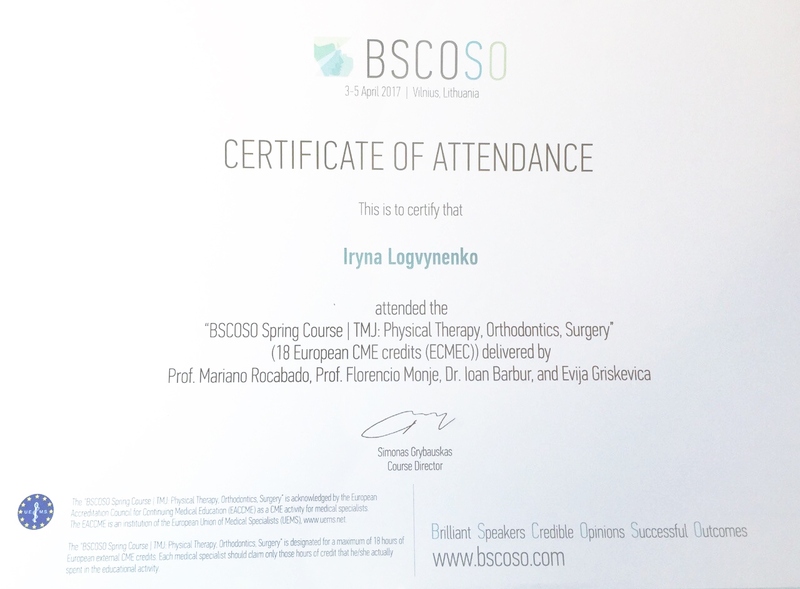 He is one of the few certified orthodontists of Ukraine, working with technique Invisalign - the alignment of teeth at any age through transparent individual CVR. She works with the new high-tech braces - system "Incognito". 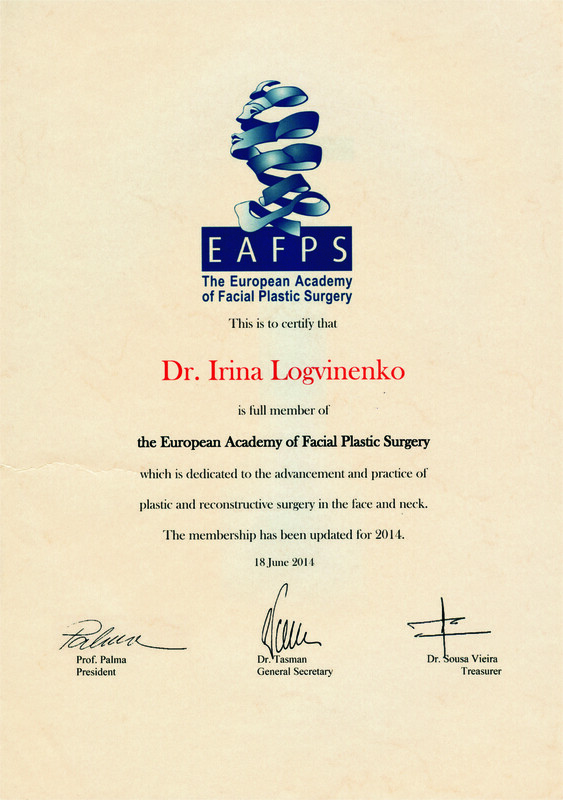 Member of the Society Lingual orthodontics (USLO). 2012 - "Precision Bracket Bonding" master class. 2011 - "Ortodontichne lіkuvannya patologії class II." 2011 - "Vikoristannya elastikіv in ortodontії." 2010 - "A new way of orthodoutics - Swing technigue Hodule III". 2010 - "The distal occlusion." 2009 - "Functional abnormalities and TMJ." 2009 - "Suchasna promeneva dіagnostika in ambulatornіy stomatologії otorinolaringologії that." 2009 - "Paradontology in orthodontic practice." 2009 - "Growth and development chelyusno-facial system." 2008 - "Device" Direct Arc "and its structural elements, particularly the use in orthodontic treatment."